In the US alone, 5,000 dogs down in garden swimming pools every single year. Worldwide, the number is even grader and if we consider cases of drowning in lakes and rivers, the statistics look even grimmer. Even if dogs are known to be good swimmers, accidents can happen and can be prevented. Truth be told, not all dog breeds are naturals in the water like Labrador Retrievers. The ones that struggle will need a dog life jacket. A dog can struggle in the water due to its age, health conditions or even breed. A life jacket will help the dog remain above water. It will not allow him to drown and it will make it easier for the owner to take the dog out of the water. There are many different styles of dog life jackets but it all comes down to safety and getting the right size. We found 10 dog life jackets that will help prevent unpleasant situations. 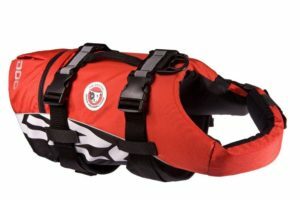 Here is our selection of the top 10 best dog life jackets in 2019. 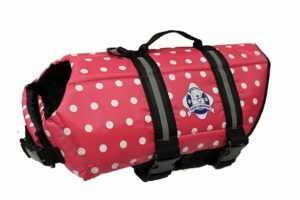 The Vivaglory Sports dog life jacket is a good pick for the ones that are concerned about the safety of their furry little friend. It is a colorful jacket with multiple reflective stripes. The jacket is available in 8 different colors and 4 sizes. According to Vivaglory, the jacket passed CA65 standard which means that it is safe for the dog and quite comfortable to wear. The interior has a soft padded material while the outer side has plenty of adjustable straps. 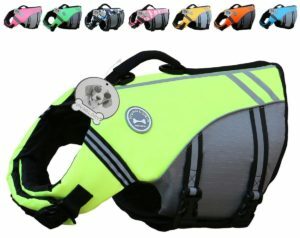 Paws Abroad dog life jacket is a good pick for the ones that do not want to spend too much. It is a well-built jacket that uses a thin flotation material and a simple design that makes it comfortable for the dog and very easy to put on. The jacket comes with 2 adjustable straps for the chest and one for the neck. At the top, it comes with a simple handle while the sides have a reflective material which will help notice the dog easier in the dark. 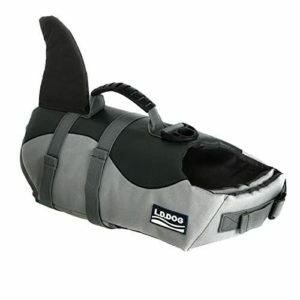 HAOCOO dog life jacket combines utility with a touch of cuteness. The model has a shark fin added on the back which gives it an interesting design. It is made to offer safety and comfort for the dog. Like most other dog jackets, the model is made with adjustable straps. It has 2 adjustable straps for the chest and 1 for the neck. At the top, it has a small handle that will help get the dog out of the water safer and easier. Paws Abroad dog life jacket offers premium protection for dogs and give peace of mind to the owners. The model is made to be durable, easy to put on and just as easy to remove. At the same time, it does not choke or feel uncomfortable for the dog. For the jacket, Paws Abroad used a very light floating material and reflective straps to make it visible during the night. It comes with a handle at the top like most other jackets and it is very easy to adjust. The model is available in 6 different sizes and comes with quick release buckles for the straps. For the chest, the jacket uses 2 adjustable straps and a third one to secure it around the heck. 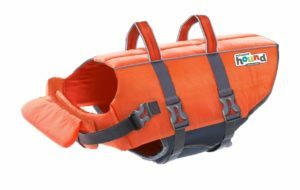 EzyDog Doggy Flotation life vest can truly make a difference and will be proved to be useful especially for the ones that have an old dog or a dog with health problems. It helps the dog stay above water and prevents undesired events. The vest is made using advanced manufacturing techniques. It uses 50% more floating material and comes with reflective straps. The vest also has 2 straps for the chest and one around the neck which makes it stay in place properly. In terms of size, the vests use adjustable straps. They are also available in 6 different sizes. The largest one fits dogs of up to 24 inches in body length and a maximum weight of about 90 pounds. Bigger may not be able to float properly with this vest. 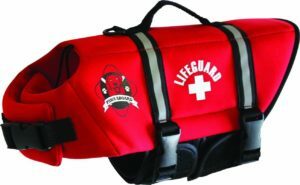 Outward Hound Dawson dog life jacket is a very simple vest that was built to last and provide the right amount of safety. It is made using a neoprene layer that provides insulation especially for dives in cold water. Like most other dog life vests, it has some standard safety features. 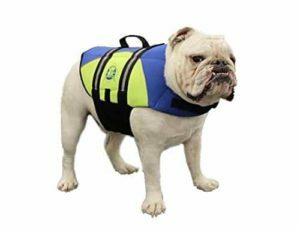 The vest comes with reflective straps to make it easier to spot in the water and has a handle so that the owner can pull the dog out easier. Build quality is better than on most vests. The side foam panels also act as insulators which help the dog maintain proper body temperature. On the front side, the foam helps support the head and neck of the dog. 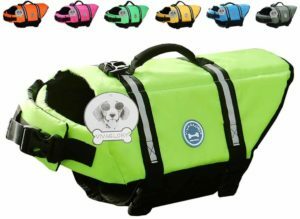 Vivaglory dog life jacket is one of the most affordable one on our list. It is still well made and does not feel cheap at all. It was made to be reliable and comfortable for the dog. According to the manufacturers, the jacket has 50% more flotation material to sustain larger dogs and keep them above water. It is made using heavy duty tear-resistant material and feels quite lightweight. The vest, like most others, is available in several colors and 4 different sizes. All of them have a removable front float assist that provides support for the head. 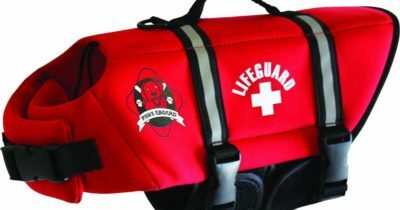 It also comes with a convenient handle to make it easy to pull the dog out of the water and reflective straps mounted on the sides of the jacket. Vivaglory reflective dog life jacket offers excellent protection for the most price. This inexpensive jacket has all the standard features and was made to be comfortable and easy to put on the dog. The jacket uses 2 adjustable straps for the chest and an additional one around the neck. To make it easier to pull the dog out of the water, the jacket comes with a textile handle at the top. The material from which it is made is tear-resistant while the floating material inside can sustain a decent amount of weight. Since dog breeds can vary in size, the jacket has been made in 5 different sizes. They are also made in 6 different colors. For practicality, the jacket has been fitted with a D-ring that can be used to attach a leash. 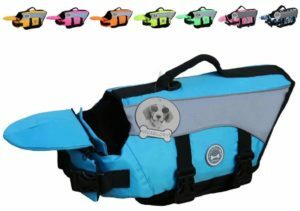 Paws Abroad double doggy life jacket proves to be an ideal choice for the ones that do not want to spend a lot of money. It is a great little jacket with a simple design and well made. The jacket is made using the tear-resistant fabric and lightweight floating material. The jacket is available in 6 different sizes and 4 colors. All of them have the same design with 2 adjustable straps for the chest and one around the neck. The top of the jacket has a small handle to make it easier to lift the dog out of the water. As far as practicality goes, the jacket takes less than a minute to put on and adjust. The straps have a quick release buckle while the sides of the jacket have a reflective material. 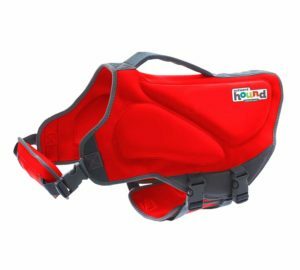 Outward Hound Kyjen dog life jacket is yet another budget product that does not disappoint. It has all the safety features the dog and owner will need and manages to still be comfortable and practical. The jacket is made with adjustable straps and quick-release buckles. There are 2 for the chest and an additional one around the neck. The floating material used can support even large dogs while the reflective elements make it easy to spot in the dark. Like most other jackets the model is made in several different sizes. It 4 colors available and was design to be mounted less than a minute. Taking it off is just as easy. Truth be told there is not much that can go wrong when it comes to a dog life jacket. They are fairly the same with some differences in terms of design. Pricing is probably the biggest variable in most dog jackets. There are still some elements that differentiate them but not by much. For a dog owner, there are several things to look out for to ensure that the jacket is right for a particular dog. Fortunately, it is not difficult to pick the right one. Size: Size is the most important thing to look at. Most jackets are available in multiple sizes. Getting a smaller jacket can work to a certain degree. As the straps are adjustable, it can still fit but because it is smaller than what it should be, the floatation material might not be enough to keep the dog above the water. Top mounted handles: All jackets have at least one handle mounted on the top to help pull the dog out of the water. Larger dogs will be more difficult to lift which is why some jackets may have two handles. Quick release buckles: Not all jackets have quick release buckles. These will prove to be extremely useful and practical. Size is the most important aspect when looking for a dog life jacket. Everything else does not matter all that much. All of them have flotation material inserted and reflective straps. The size needs to be always right. If the jacket is too small for the dog, it will not be able to keep him properly above the water. Our list has a good selection of jackets. Some of them are cheap while others are a bit more expensive. What is important to understand is that even the cheapest jackets can be reliable and practical.